Caring for a loved one with Alzheimer’s is a demanding role. For caregivers who need some time to run errands, take care of their own health needs, or just need a break to rejuvenate, Azalea Gardens provides the same compassionate care to our temporary residents as those who call us their home. Arranged into private, shared and semiprivate accommodations, our assisted living environment and caring staff provide meaningful moments to each resident. If you loved one needs a temporary home while recovering from an injury or hospitalization, we assist families through the recovery process and allow for caregiver relief. We are committed to honoring the experience of aging by ensuring that each resident’s life story is incorporated into their individual respite care design. 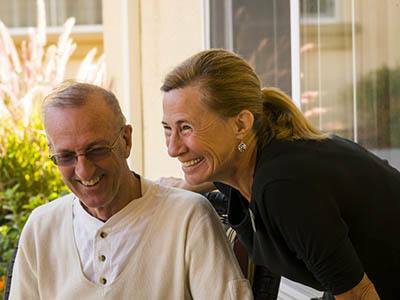 Our beautiful and comfortable respite care community is committed to being a leader in providing quality personal services to residents and families, becoming a true partner in care for those whose lives are influenced by Alzheimer's and dementia.